In an age where food is literally all we think about and tend to dismiss a friend’s rant as we wonder what to have for dinner, an idea emerged to create a well-seasoned event, with the theme for the night being food. The Miller Partnership and Jukebox, who sponsored the event following on from last year’s successful Fine and Funny Dining evening, lined up five saucy comedians who had a variety of sweet and rather savoury jokes for the crowd (one in particular being very pungent but we’ll discuss that later). The Food Glorious Food Jukebox Jokeslam at Soft Touch Arts was truly an evening of Foodie fabulousness. Guests grabbed their preferred welcome beverage and headed to their tables ready to indulge in our buffet, whilst anticipating the comical entertainment for the night. A special thanks goes to Manish from The Boot Room who sponsored the welcome drink and donated some very fine wine for guests to enjoy. Thanks also go to the nine local businesses who donated food and beverages with vouchers for our raffle prizes, so we thank you Brü, Lilu, Chutney Ivy, Gelato Village, Steamin’ Billy, The Lighthouse Kibworth, 33 Cank Street and Boboli. Our long-term partners and business ambassadors, Tracey and Pete from The Miller Partnership, made the evening possible through their generous sponsorship and we are extremely grateful for all the support they give to our charity. Carl Mifflin from Howes Percival opened the night with a charismatic bang about glorious food, deprivation and the misery of food lacking flavour when on a diet. Carl’s story on breaking up with chocolate bars set the bar high and made the audience cry… of laughter. Next up was James Sheridan, a participant from Soft Touch who has been involved with us for the last ten years, initially being referred with mental health issues but now a confident young man and performer. He had the audience cracking up from his set of original food-flavoured jokes and puns. We must say that we are very proud of his progression and having the confidence to get on stage to perform in front of an audience of 80 people. Third in line we had Chris Rees from Howes Percival who soon had the audience wearing cheesy grins. Chris Rees’ stand-up comedy about his original list of ‘I can’t stand these foods’ was indeed very relatable. He also ticked off a preferred food checklist which included Mango, Cherry Pepsi Max, and Pick N Mix Sweets – sounds like a student’s breakfast if I do say so myself! The crowd was definitely served some Mill-Shake with our sponsor of the night’s event, Pete Miller. He chose to evaluate a few personal experiences causing the audience to roar with laughter. Pete has most definitely been through some eventful times so it was logical to share them by taking to the stage. I’ll have some squid with that, please! Chris Greenwell from Gateley PLC introduced a Scandinavian food theme – from food items consumed in Scandinavia worthy of a feast for a king including grated reindeer heart. To wrap up the humour he introduced a rather well seasoned food (to say the least) – Chris put our nasal senses to the test in full effect. With Surströmming… Wikipedia says it is a “lightly-salted fish with a “strong smell and somewhat acidic taste”. 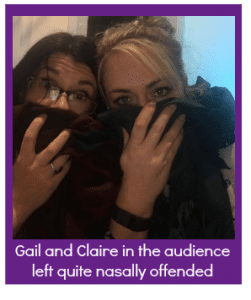 I say it is a cuisine to avoid for a lifetime, and many from the audience would most likely agree as they ran for the doors with napkins over their faces! George Egg, our highlight of the show appeared to absolutely crack the crowd up and whisk them away using hotel appliances seasoned with associated hotel stay stories as he produced some amazing gourmet food. Demonstrating a variety of ways in cooking with ‘not your average kitchen utensils’, the audience was seemingly eager themselves to go home and create their pancakes using a household iron. Using just the equipment you’d find in a hotel room, George cooked a three course meal and the audience got to taste it at the end. A few nods of approval from the crowd as scrumptious pancakes were served with toppings such as nuts and maple syrup. Yum! The audience appreciated the anarchist gesture in the tips provided by George in surviving a night of bland food during your next hotel stay. 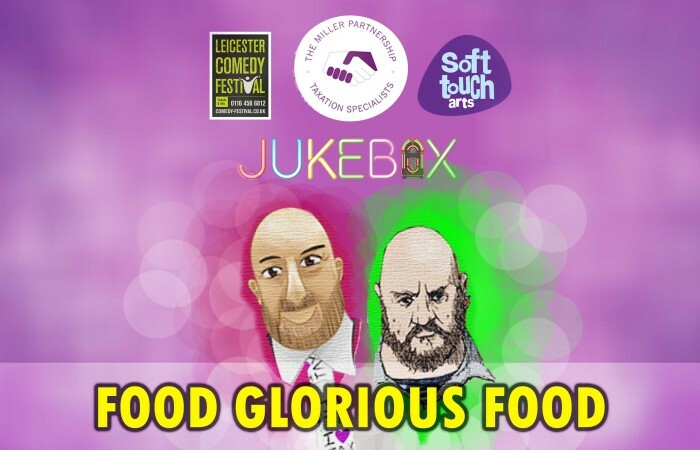 A big thank you to Jukebox Leicester who sponsored the costs of bringing George Egg to Leicester for the show. He definitely earned the title of a Feast Improviser. Bravo! The success of Food Glorious Food will help Soft Touch to continue running our STart programme which supports young people with extra support needs and helps them progress in life through involvement in creative activities. We would like to thank everybody who attended and you all helped us raise the stunning amount of £2,800. We hope to see you all at future events and please do share this blog with your friends so that they can get a taste of what they missed out on!